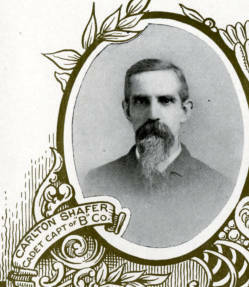 Biography & Genealogy: Carlton Shafer, Class of 1864: New Market Cadet; Third Cadet Captain, Co. B. Genealogy: Born- April 3, 1844, in Loudoun Co., Va. Father- Frederick William Shafer; Mother- Susanna Lezear. Pat. Grandparents- unknown. Mat. Grandparents- unknown. Married- Sarah Andrew; no children. Careers: Lawyer, Legislator. Died- April 26, 1906, in La Porte.